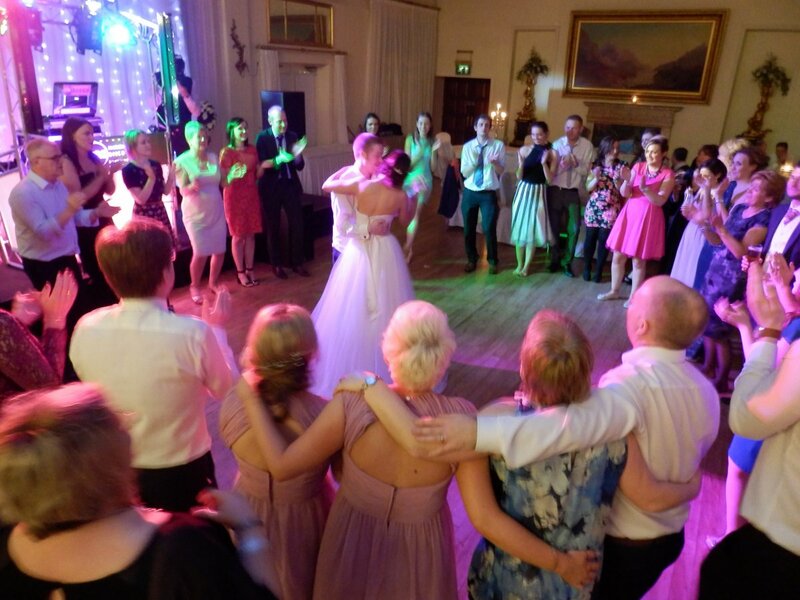 The Full Night Package includes everything you need to have a highly enjoyable evening without needing to worry about anything other than booking the venue and sending out the invitations! Please ask for a free quotation for your event. 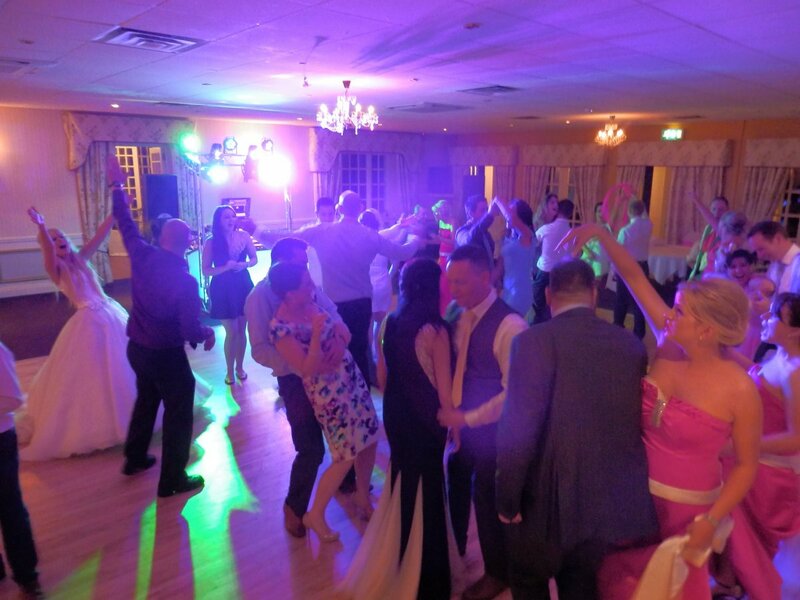 • A top quality professional disco sound system to ensure the music you'll be listening to is crystal clear and delivered at the correct volume for your event. The sound system used will be selected depending on the number of guests attending and the size of the venue. I now exclusively use sound systems used manufactured by industry-leading professional audio specialists Bose. 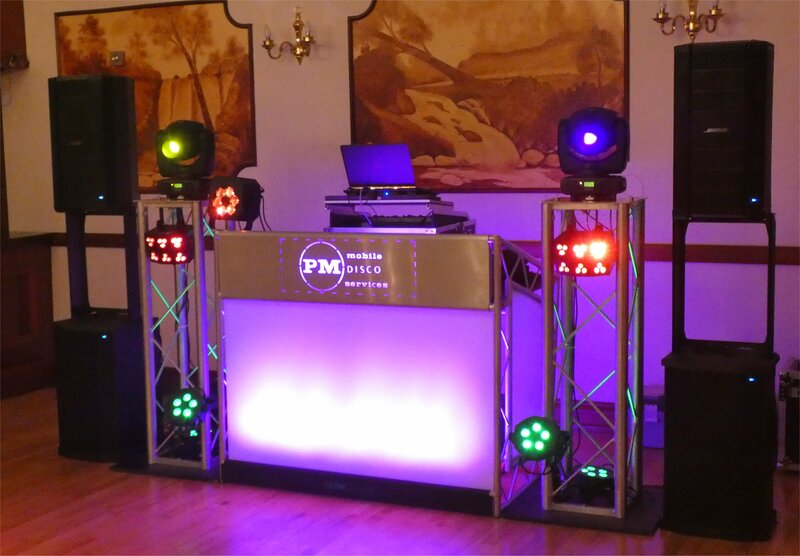 • A Professional DJ Booth to ensure that the equipment is set up as neatly as possible. 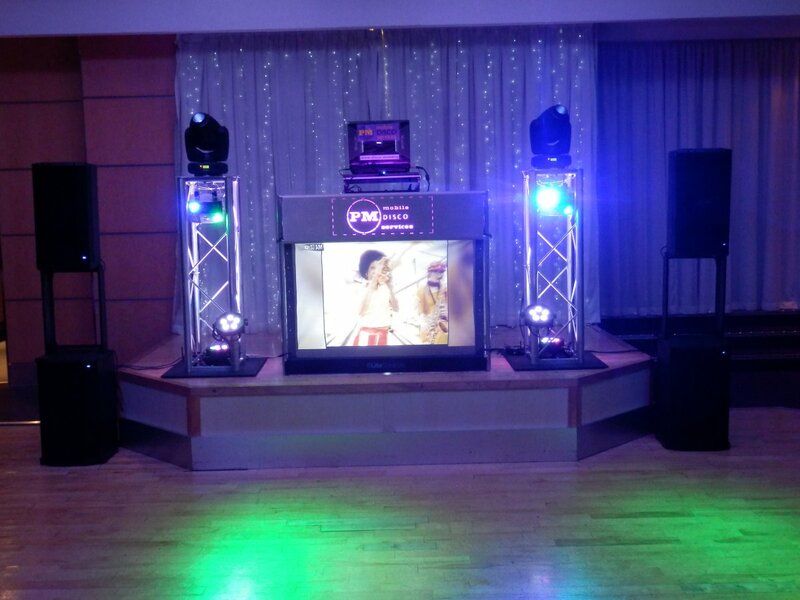 The DJ Booth can either incorporate mood lighting, or an integrated video screen within it. You can indicate your preference on your booking agreement. There is no difference in cost for either option. Note however that the DJ Booth cannot be used in a small number of venues (where space to setup is extremely limited or where access is difficult - i.e. via stairs or a small lift). 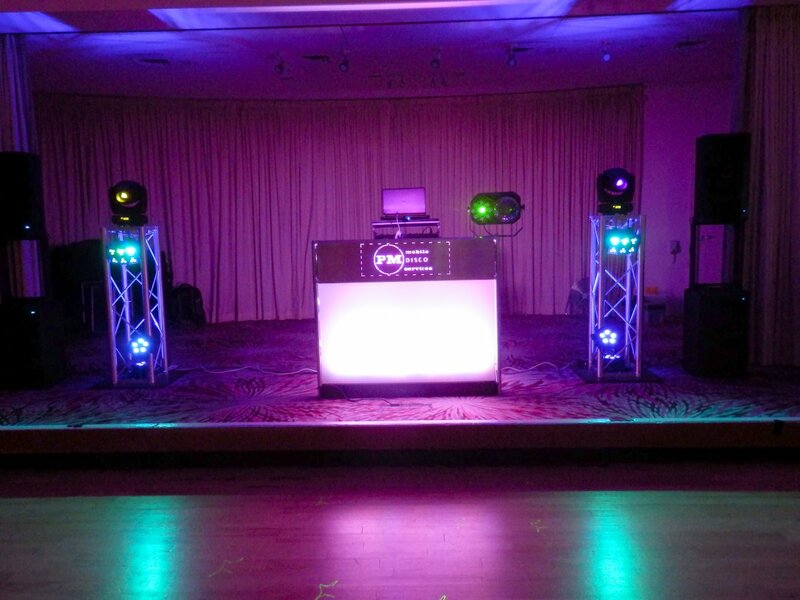 • A selection of computer controlled disco lighting effects to create the appropriate party atmosphere. 9 lighting units of various types are mounted overhead on a lighting gantry as part of the DJ Booth, with a further effect within the DJ Booth if mood lighting has been chosen. All the lighting used is modern & professional - no tacky rope lights, police beacons or effects that consist merely of a box of flashing coloured lightbulbs are ever used. In recent years I have invested in a range of new LED based effects which offer much greater energy efficiency than traditional disco lighting effects and they are also safer as they do not become hot during use. Note that the lighting gantry is not suitable for venues where the ceiling height is very low (less than approx 2.3m). In such cases, alternative lighting will be provided. • Set-up and take-down of the equipment. Set-up takes approximately 30-40 minutes and take-down takes approximately 30 minutes. Exact times vary from venue to venue depending on ease of access, size of room, etc. • Performance. Music starts once equipment is setup after your meal (or from the start of your party if it is an evening only event) and continues until the end of the night (latest 1:00am except by prior arrangement). Maximum playing time is 6 hours which is more than enough for the vast majority of events. • Travel to and from your chosen Venue. • All my equipment and electrical cables undergo Electrical Safety (PAT) Testing at least annually to ensure everything remains safe for use. • £10m Public Liability Insurance Cover. While I've been a DJ since 1992 and have thankfully never had a need to use this policy, this cover is in place to offer protection in the extremely unlikely event that PM Mobile Disco Services is deemed to be liable for bodily injury or property damage through negligence, etc. Proof of adequate public liability insurance is required by many venues before they will allow performance to take place. My certificate of insurance cover is available on request. •...and, of course, your DJ, Paul Mulvenna!! Not only am I there on the day to provide your entertainment, but I am happy to provide any advise or assistance you need while planning your event. I will be in touch shortly before your event to discuss the detail of the evening with you, but if you want to ask advise on any aspect of the evening, check if something is possible, organise a theme, etc, feel free to get in touch and I will do what I can to assist.